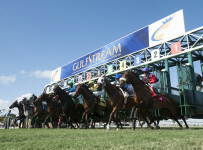 Gulfstream Park on Wednesday will draw post positions for Saturday’s $1 million Florida Derby (Grade 1). 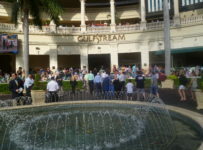 The draw will be at 11:00 a.m. in the Ten Palms restaurant on Gulfstream’s second floor. 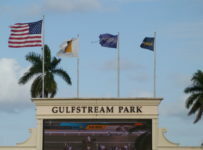 On Wednesday afternoon, Gulfstream will announce fields for the Saturday card. 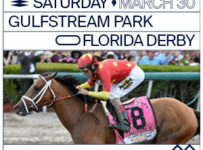 The $1 million Florida Derby will be one of the day’s eight stakes races. We will be at the draw on Wednesday for reports on this Web site and our blog, as part of this week’s daily coverage that will include being on-site Saturday. 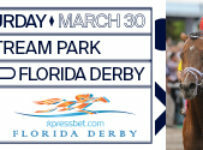 As of Monday morning, six horses were listed as likely starters for the Florida Derby, which is 1 1/8 miles on dirt for 3-year-olds. Considering the size of the race’s purse, the field could wind up with between eight and ten horses. Mohaymen and Nyquist are listed as definite starters by their human connections. Both are unbeaten and they are generally regarded as the two top contenders for the 1 ¼ mile Kentucky Derby, to be run May 7 at Churchill Downs in Louisville, Ky. 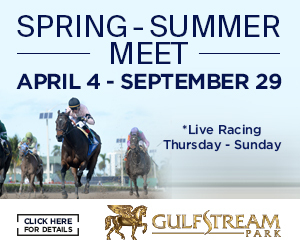 The other four horses that thus far are listed as likely for the Florida Derby are Fellowship, Ifyousnoozeyoulose, Sawyers Mickey and Majesto..
At Gulfstream this year, Mohaymen won the Holy Bull (photo on home page) and Fountain of Youth–both Grade 2 at 1 1/16 miles on dirt. Mohaymen is owned by Shadwell Stable and is trained by Kiaran McLaughlin. Nyquist’s wins include last year’s 1 1/16 mile Breeders’ Cup Juvenile (Grade 1) at Santa Anita in Arcadia, Calif., his home track. Owner Paul Reddam and trainer Doug O’Neill are sending Nyquist east because the horse will receive a $1 million bonus if he wins the Florida Derby. 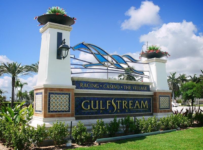 Fasig-Tipton and the Stronach Group, Gulfstream’s parent, are paying that money if a horse wins the Florida Derby after being put up for sale at the Fasig-Tipton Sale at Gulfstream in March 2015. Reddam bought Nyquist for $400,000 at that sale. 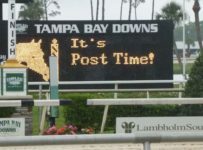 Information on whether any of the other Florida Derby nominees are eligible for the $1 million bonus is not readily available. It is expected that regular jockeys Junior Alvarado and Mario Gutierrez will ride Mohaymen and Nyquist, respectively. Fellowship, trained by Stan Gold, finished third in both the Holy Bull on Jan. 30 and in the Fountain of Youth on Feb. 27. 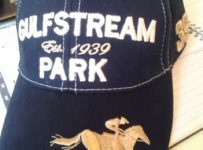 Last Oct. 3, Fellowship won the 1 1/16 mile In Reality Stakes. 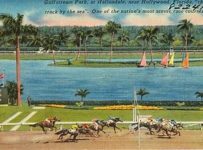 That race was restricted to sons of Florida-registered stallions that are part of the Florida Sire Stakes Series. Jacks or Better Farm owns Fellowship. 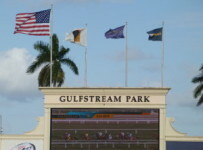 It is expected that regular jockey Jose Caraballo will ride in the Florida Derby. Sawyers Mickey finished third in the 1 1/16 mile John Battaglia Stakes on March 12 at Turfway Park in Florence, Ky. He is owned by Looch Racing and trained by Peter Walder. 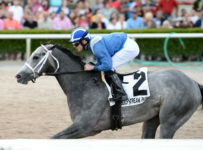 Ifyousnoozeyoulose and Majesto would be making their stakes debuts in the Florida Derby. 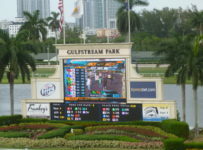 The winner of the Florida Derby will earn $600,000. There also is purse money of $200,000 for second, $100,000 for third, $50,000 for fourth and $30,000 for fifth. 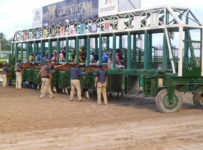 In addition, the Florida Derby winner will earn 100 qualifying points for the Kentucky Derby. 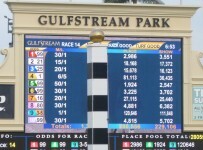 Second through fourth in the Florida Derby is worth 40, 20 and 10 Kentucky Derby points respectively. A second place finish in the Florida Derby will undoubtedly earn enough points to make the Kentucky Derby field. A review of the latest standings indicates that between 25 and 30 points will be needed to get into that race this year.